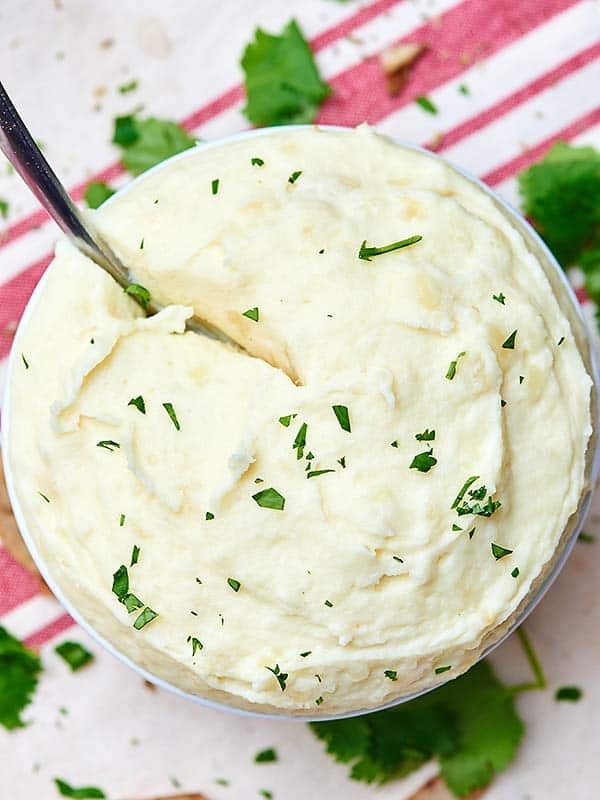 These Roasted Garlic and Goat Cheese Mashed Potatoes are perfectly lump-free, super garlicky and toasty, and so so SO creamy from the butter, sour cream, and cream cheese. The goat cheese adds just the right amount of tang to round the whole thing out! Ummm. My apartment smells better than freshly baked goods coming out of the oven. It smells better than a Yankee candle. It even smells better than puppy breath. Because I have garlic roasting in my oven right now and holy moly it smells amazing! 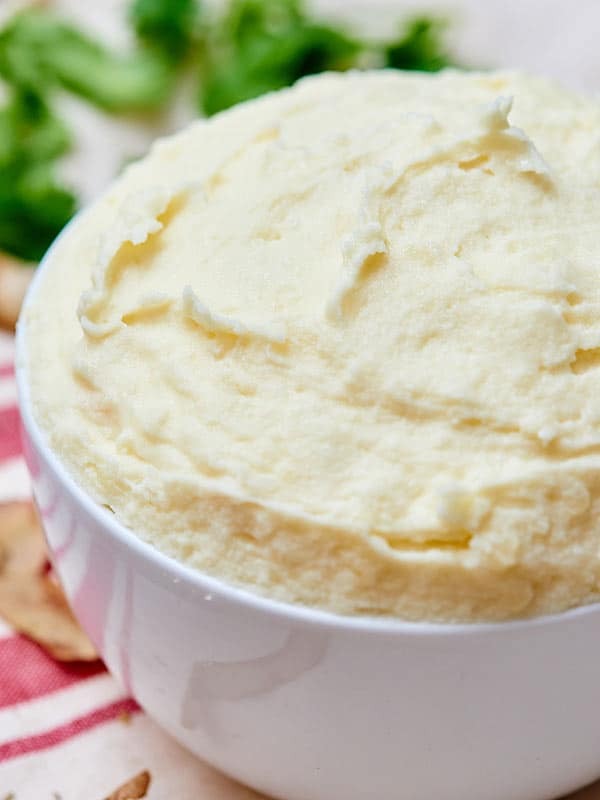 There’s pretty much a constant stream of drool coming out of my mouth, because it smells so good… and what better way to use roasted garlic than in these roasted garlic and goat cheese mashed potatoes? 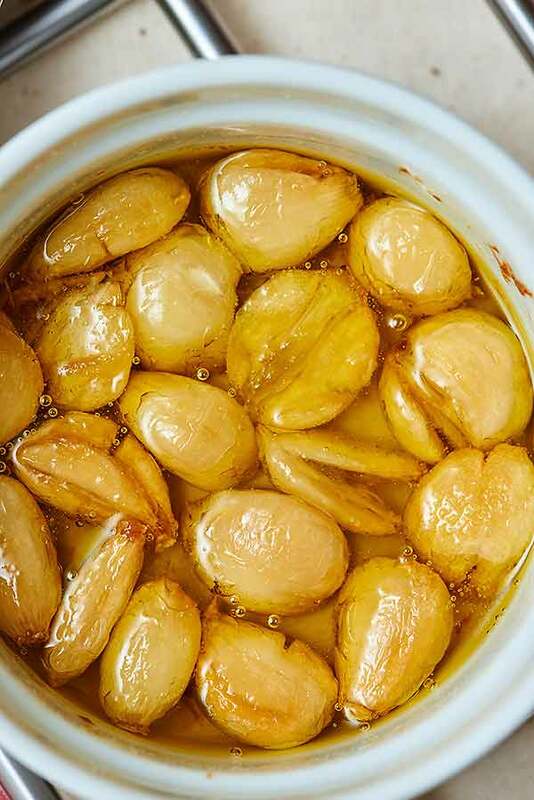 I roast my garlic by peeling the cloves, just like you would if you were going to mince them, but leave them whole and place them in a dish and cover with olive oil and a touch of salt. 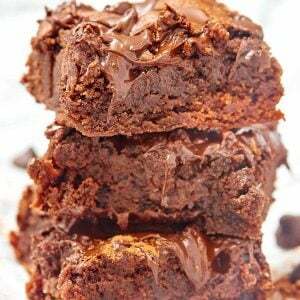 Cover with foil and bake until golden brown. 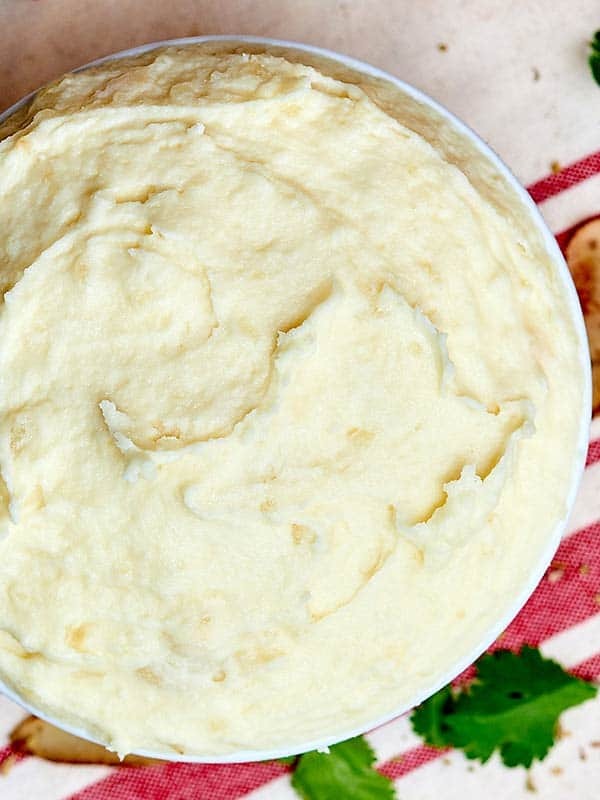 I like using this method, because then your olive oil is full of roasty garlic flavor and you can just dump the whole thing into your mashed potatoes! 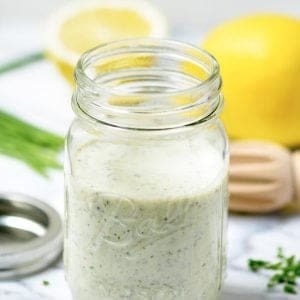 You can also check out this recipe if you want to do the traditional way of roasting by cutting off the top of the garlic bulb. When I was trying to come up with today’s recipe, I was trying to think of some of my favorite things. I knew I wanted to make a side dish, because I have this really amazing ham recipe (coming soon!) and I needed something to go with it. 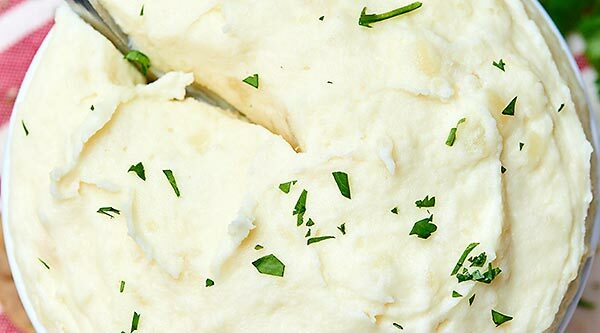 It took me a total of 2 seconds to decide on mashed potatoes based off of my Gram’s recipe, because mashed potatoes are my favorite. 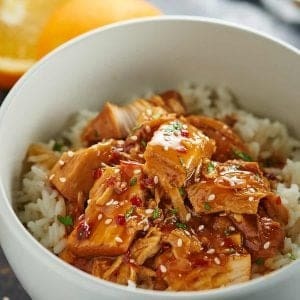 Although it’s one of my all-time favorite recipes, I wanted to do something a little different. That’s where the roasted garlic came in. Then I thought, what could pair more perfectly with roasted garlic than goat cheese? 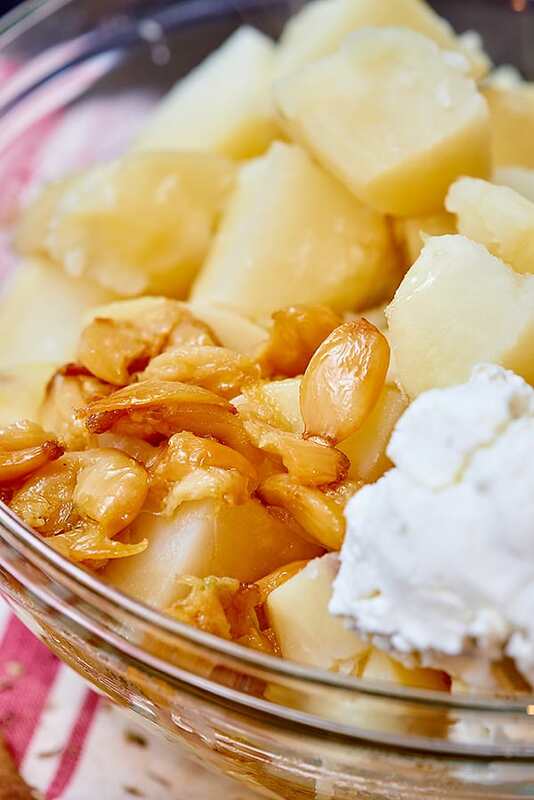 Add in some butter, sour cream, and cream cheese and you have one heck of a side dish. 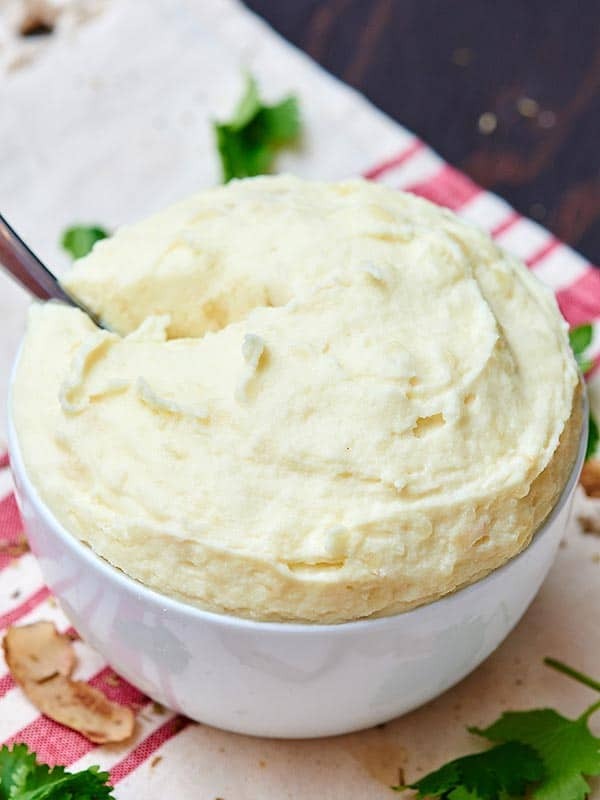 I made these potatoes by boiling them in the microwave, just as I did in my Gram’s Creamy Mashed Potatoes recipe, but feel free to boil them on the stove if you’d prefer! After the potatoes are cooked, drain them. Then you’re gonna whip ’em, whip ’em goood until they are lump-free and fluffy! I used my stand mixer, but if you want lumps, a potato masher would be fine, too! But I have to admit, I’m a lump-free potato girl. Then mix in your roasted garlic/oil, goat cheese, butter, sour cream, and cream cheese! Season with salt and taste test. 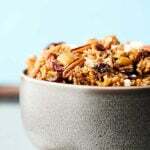 As with a lot of my recipes, this can easily be customized to your own taste buds! Add as much or as little of each mix in as you like, but I think that this is definitely the best ratio! 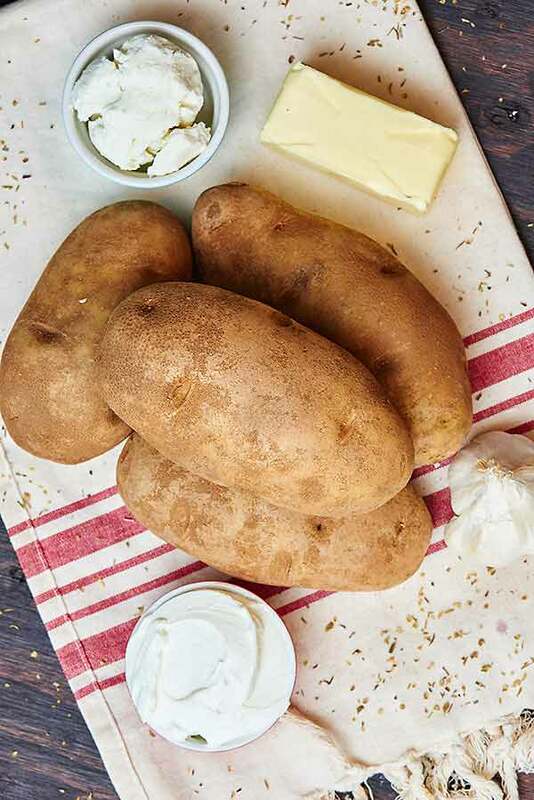 😉 The potatoes are perfectly lump-free, super garlicky and toasty, and so so SO creamy from the butter, sour cream, and cream cheese. The goat cheese adds just the right amount of tang to round the whole thing out! How do you roast your garlic? Show me the yummy! The potatoes are perfectly lump-free, super garlicky and toasty, and so so SO creamy from the butter, sour cream, and cream cheese. The goat cheese adds just the right amount of tang to round the whole thing out! Start by peeling the garlic cloves, just like you would if you were going to mince them, but leave them whole. Place them in a dish and cover with olive oil and a touch of salt. Cover with foil and bake until golden brown and soft, about 30 minutes. 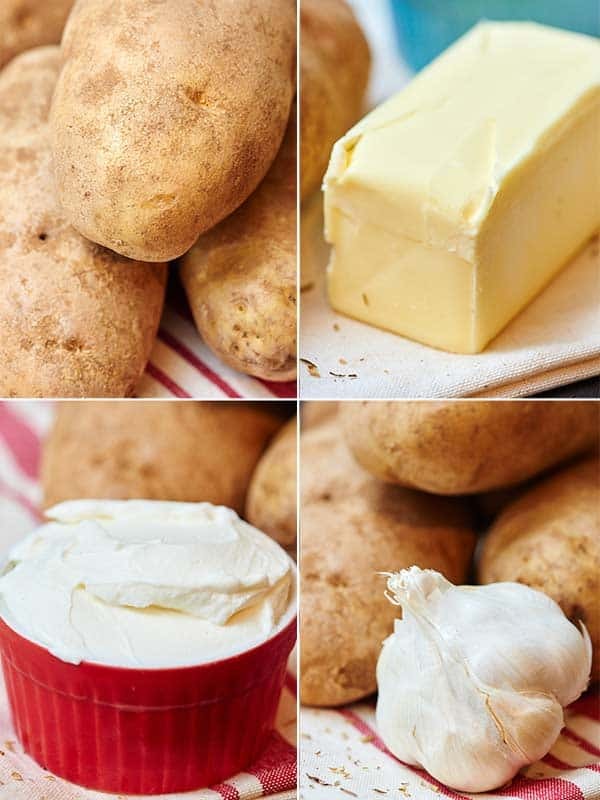 Rinse, peel, and cube potatoes. Place cubes in a microwave safe bowl and add enough water to fully submerge the potatoes. Sprinkle with salt, cover with a paper towel, and microwave for about 30 minutes. The potatoes should fall apart when pierced with a fork. After the potatoes are cooked, drain them. Then you're gonna whip them until they are lump-free and fluffy! 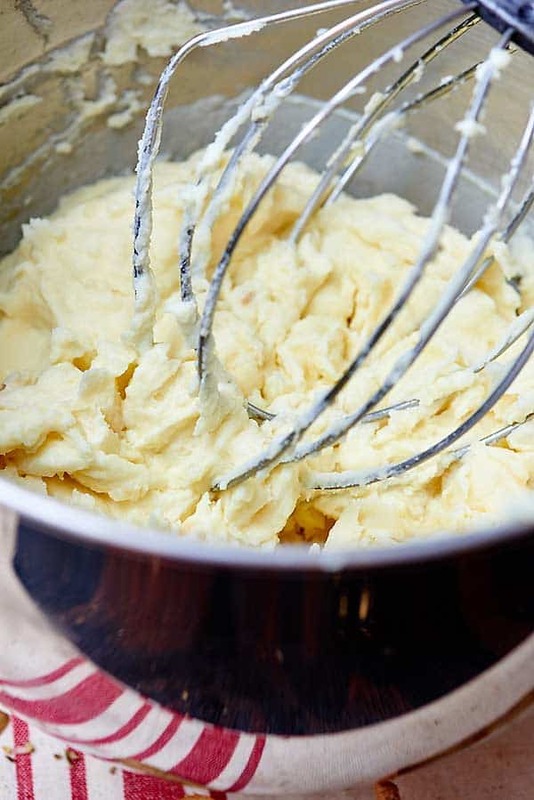 I used my stand mixer, but if you want lumps, a potato masher would be fine, too! Then mix in your roasted garlic/oil, goat cheese, butter, sour cream, and cream cheese! Season with salt and taste test. GIRL! 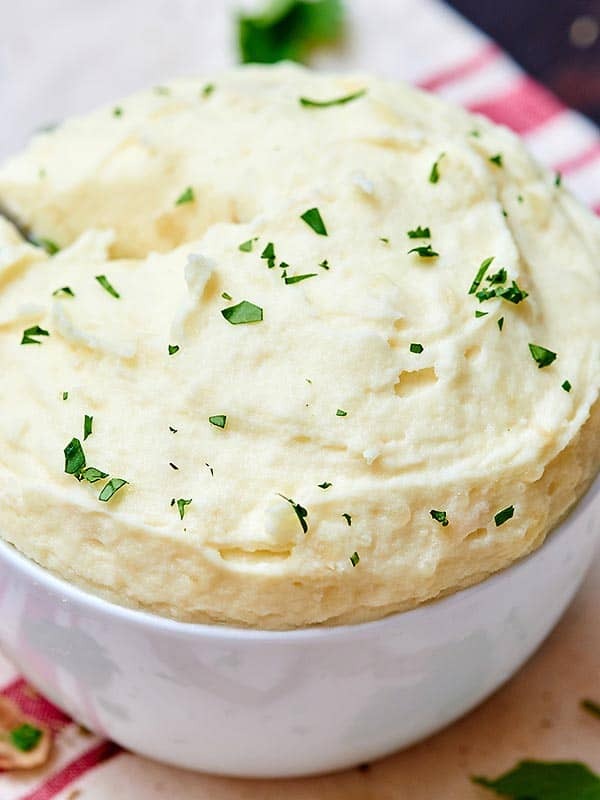 I love mashed potatoes and dressing them up, and these garlic and goat cheese mashed potatoes look amazing!!! Thank you for the great recipe. Shared it with my sister. Who is making it for a company potluck.